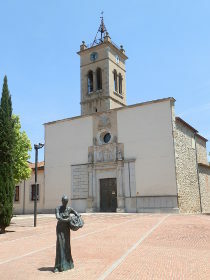 Parlava is a small village on the main route between La Bisbal d'Emporda and Figueres prior to crossing the river Ter at Verges. As such it's a village that many people will pass through on their way to somewhere else. This is really a walk of three churches and the September day had a strong autumn mist, so it was not a good day for photographs. 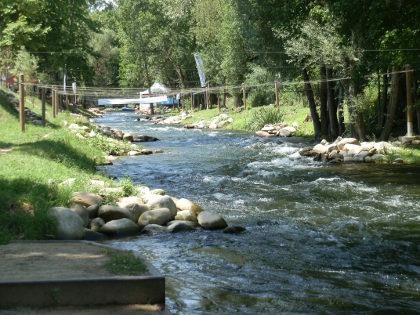 It would be fair to say that Parlava is not a particularly noteworthy village. 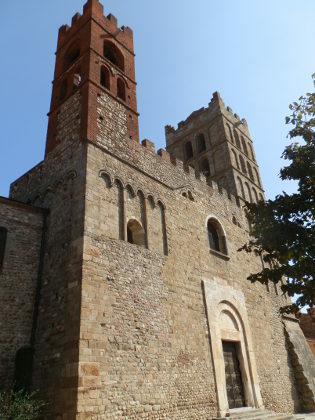 It has a church and a handful of old streets but nothing that really catches the eye. 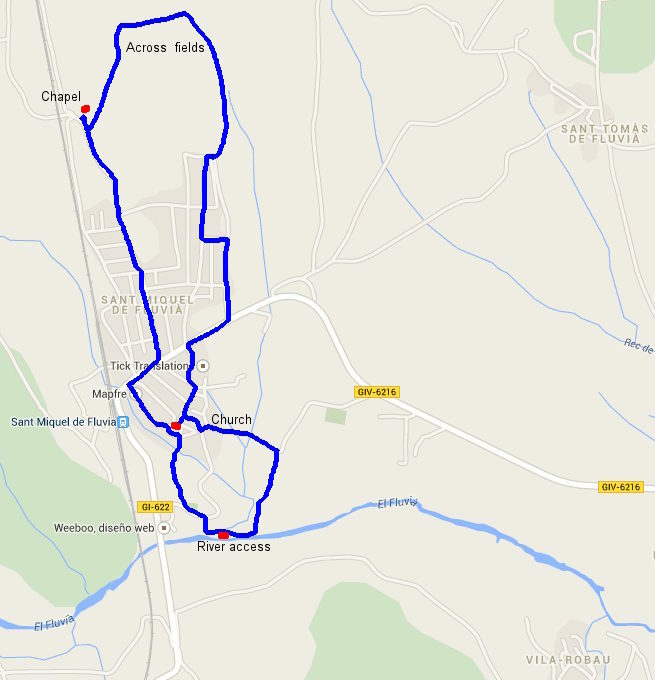 The walk though is relatively flat and links with Rupia and La Sala - an area we've walked before (Rupia and Foixa) coming at Rupia, which is more interesting, from a different direction. 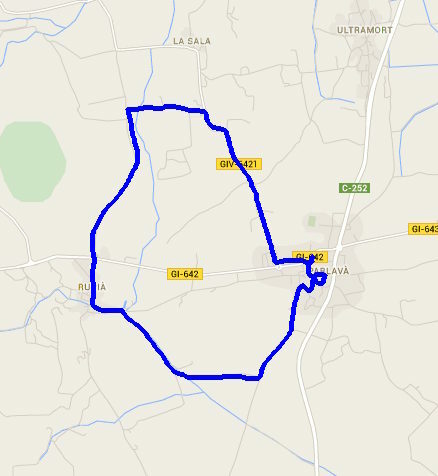 After visiting the village centre we follow the bike route out in the direction of Casavells which leads out into the fields. At this time of year, fields are being ploughed and the landscape is a mixture of earthy browns and khaki greens. 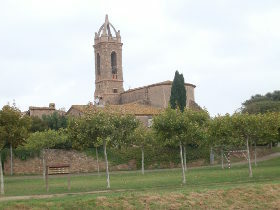 As we're walking there are views to Castell d'Emporda but otherwise it is a simple flat walk. At the first proper turning right we follow the track towards a pig farm - there are no signposts but it is obvious that it is going towards Rupia in the distance where we can see the church. 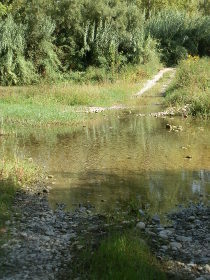 The track turns into a lane by the farm and we simply follow it to the stream at the entrance to Rupia. 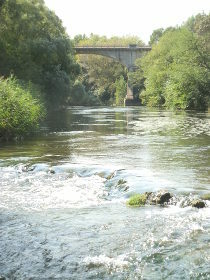 There are children playing with sticks in the water and a small playground. 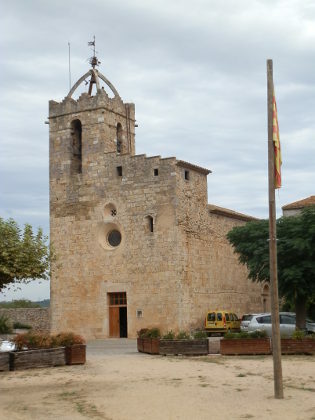 A quick visit of Rupia and we head out across the main road (which links Flaca to Torroella de Montgri). 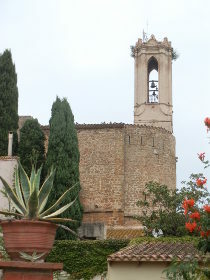 This is part of our early walk so we know we will find the strangely isolated church at La Sala along the road. 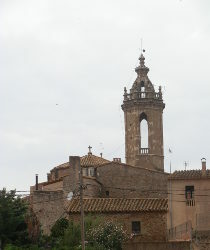 At the crossroads, we turn up past the La Sala church and can see that it seems to be linked or connected to a farm. There are a number of old and new farmhouses in the area some of which look quite luxurious. After the church we need to walk on the road, turning right up the hill to link back to Parlava. For a quiet back road there are more cars than we would expect, but this could just be the time of day. 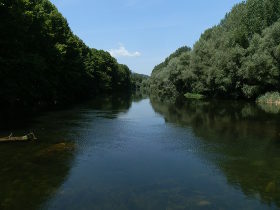 And so back to Parlava along the main road - a walk of three churches, but not too much else. 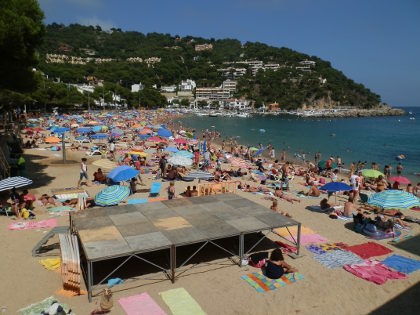 Llafranc is probably the prettiest of all the beach-side villages on the Costa Brava with a perfect-sized golden-sanded beach backed by chic upmarket restaurants and hotels that look straight over the bay. To the right, looking out to sea, are rocks and the headland that leads to Calella de Palafrugell (about 20 minute stroll). To the left are fishing boats and a small marina underneath the hill that leads up to the lighthouse above the village. 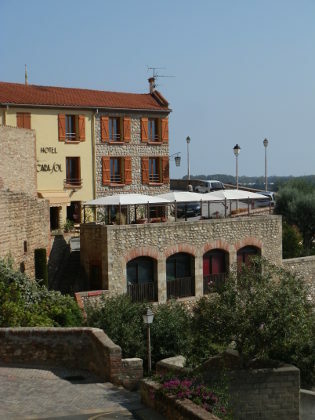 In many ways it's the picture perfect seaside location, small and discrete retaining its original fishing village charm. 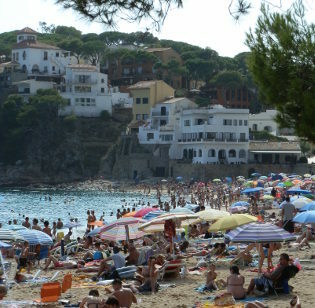 The downside is that during the height of summer, Llafranc can become busy and crowded with a towel on almost every square metre of the beach and with parking almost deliberately limited, it can be hard to find get access unless you're in Llafranc itself, willing to walk or starting out early in the morning. Fortunately this only really applies for the four-five weeks of the end of July and August. 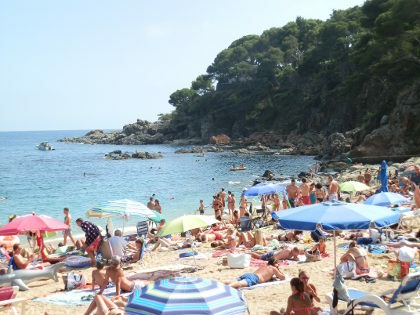 June and early July are just perfect, and by the first week of September the crowds have melted away leaving more knowledgeable travellers and locals to enjoy the beach and swimming. The beach itself is sandy - a little gritty towards the rocks to the right, but finer without being powder soft, in the centre and to the left before the fishing boats. For snorkelling the rocky areas to the right are best - you may even get lucky and spot an octopus even in the August height of summer. The rest of the bay is quite deep and sandy - it deepens relatively quickly after the first 2-3m and is clear for swimming, though the bay always feels a little shorter than it looks as swimming to the left hand side is limited by the channel for boat access to the marina. The beach is backed by a promenade and restaurants and hotels where the well-heeled sit taking coffee or wine looking over the sunbathers and out to sea. Given how good the location is, not surprisingly, the bars have a tendency to be a little on the expensive side. 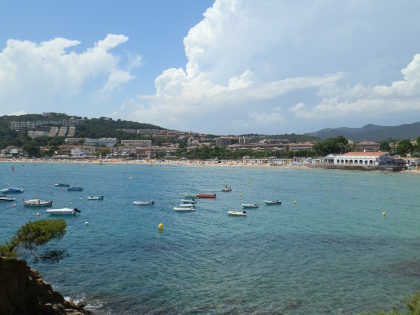 Llafranc has one Michelin starred restaurant for foodies. There are a handful of small boutiques and shops and then hotels and villas dotted around the village. On the beach, lifeguards are on duty and canoes can be rented to the left side of the beach just before the fishing boats. As with most beaches, there are beach showers with fresh water for washing off sea water (soap is not allowed). The sand is gritty towards the right, but finer elsewhere and a beautiful golden colour. The beach shelves quite quickly and the bay itself is quite deep - mostly of sand except for the rockier areas. Despite the sandy bottom, it's still possible to see fish, but obviously for snorkelling there is much more to see to the right hand side. For long distance swimmers the bay feels quite short, but off the peak season we have seen people swimming laps out by the marker buoys that separate the swimming area from the moored boats further out. Parking is complicated. In the peak of the season spaces are difficult to find and quite limited. There are two main parking areas - both of which get full quickly. 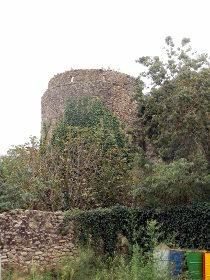 Firstly is just off the road from Calella de Palafrugell under trees to the right as the road runs down towards the village centre. 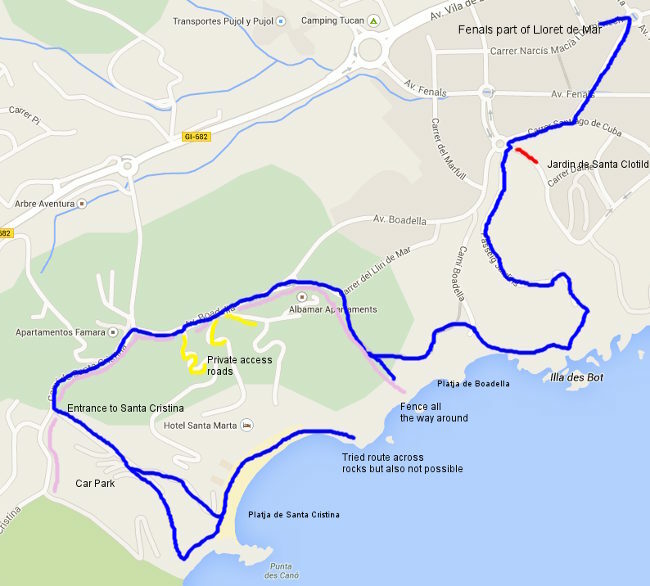 Secondly, there is parking off the back road to Llafranc past the Llafranc Tennis Club that can be found as a right hand turn from the road between Palafrugell and Tamariu. The back road fills with cars parked on the side of the road all the way to the school vacation house about 10-15 minutes walk from the beach. For this reason coming early in the morning, or just coming later in the evening is advised. 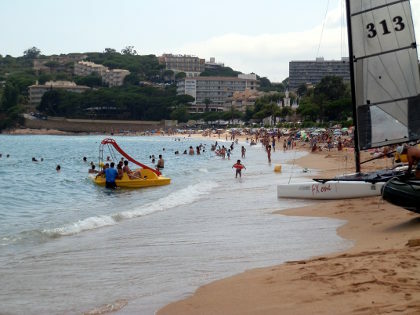 Sant Pol is a long sand crescent beach between Sant Feliu and the luxury estate of S'Agaro. 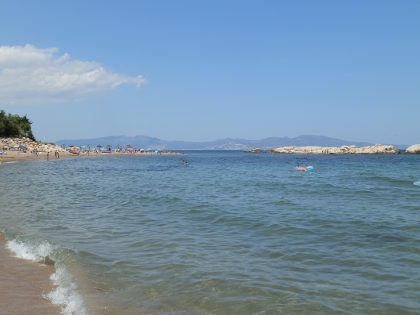 The beach opens up onto a natural bay and was one of the earliest beaches for tourism in the 1910s and 1920s when people came to take the waters rather than for the sun and sand, and Sant Pol still retains beach huts - the only beach on the Costa Brava like this. 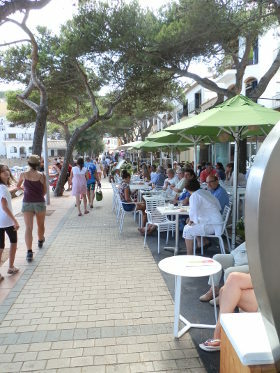 Perhaps because it was discovered in the early part of the 20th century, the beach and promenade area has been relatively protected and retains an authentic charm with modernista buildings directly behind the beach and any hotels that can be seen further back giving the whole area a relaxed charm. The beach itself is quite long - about one kilometre from end to end with a wide bay - and all sand of a rough light grit. The area to the right looking out to see is rocky and the best area for snorkelling and seeing fish, and links to a series of rocky coves and bays all along the side, so of which are only accessible from the water. These right hand rocks are also have places used for jumping and diving into the crystal clear blue water below. 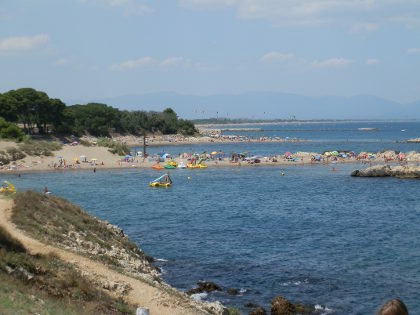 Behind the beach, in addition to the modernista buildings (one or two are now restaurants) are a number of discrete bars and restaurants, a large childrens play area, protected wild dunes and the Sant Pol Sailing and Kayaking school. 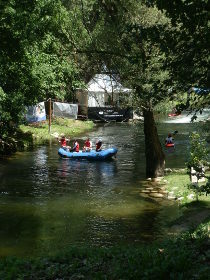 From the beach it's possible to hire canoes, pedalos and we saw speed boats for water skiing and banana-tubes. The water in the centre shelves quickly, but there is a sand bank just off shore where it's possible for adults to stand (I'd expect this sand bank may move or shift). The water was crystal clear when we were there, with boats including a very large 50m+ motor boat moored in the bay out beyond the swimming area. The sand is golden light grit almost across the whole beach. Not too bad underfoot and fine for sunbathing, but a little coarse for sand castles. From the centre of the beach, the shore shelves quickly (it may be more gentle at the two sides) but then had a sand bank about 20m out that was shallow enough for adults to stand on. 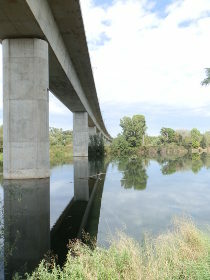 It's possible to swim long distance both left and right and out to the further limits of the swimming area. The bay is sandy at the bottom and so not so good for snorkelling except towards the rockier parts to the right. These rocky bays are excellent for exploratory swimming and extend all around the headland. 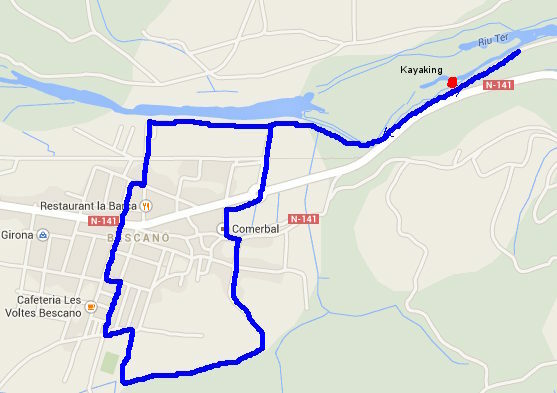 There is marked blue-bay parking all around the roads which does require payment. 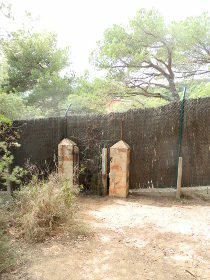 A little beyond this is street parking more into the estates towards Platja d'Aro. 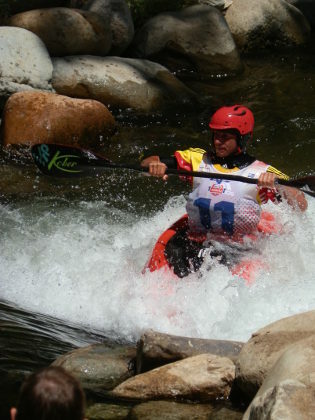 We didn't have a problem finding a space in July, but it may be busier in August. 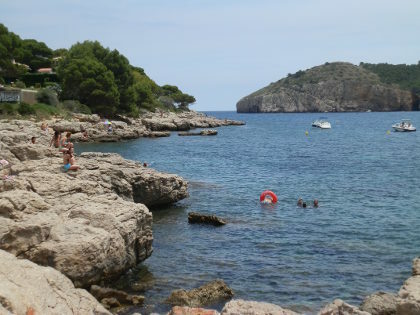 The coast walk Platja d'Aro and S'Agaro around S'Agaro is a very pretty walk/stroll on a broad well-maintained estate path, with rocky bays for snorkelling (walking access only) - non-residents can't take cars into S'Agaro. 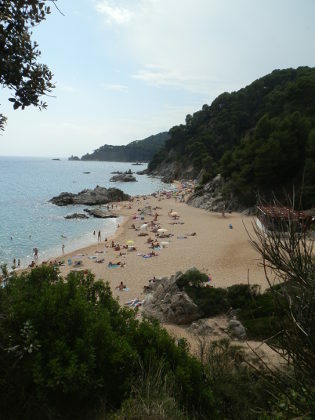 The path to the right Platja Sant Pol to Sant Feliu de Guixols along the rocks and round to Sant Feliu de Guixols is also recommended. 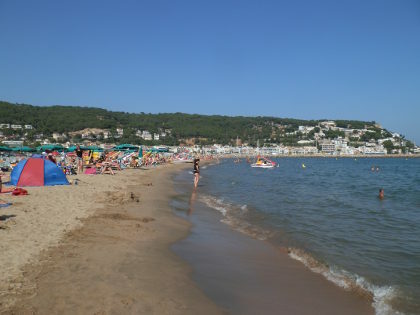 Montgo is one of the four beach areas of L'Escala and is a long sandy stretch in a half moon bay surrounded by cliffs on one side and modern houses and villas on the other on the hill below the tower of Montgo. 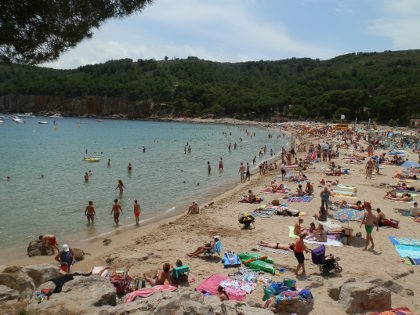 The area is some way away from the main centre of L'Escala but there are seasonal bars, shops and restaurants on and around the beach and a large campsite area meaning that it does become relatively busy during the summer season. The beach is broad with fine sand, though there are pebbles in amongst the sand towards the back. Looking out to sea along the left hand side, the coast is rocky underneath the villas above with a path that reaches to the bay entrance. On the right hand side, a path (which is rough underfoot) runs over the top of the cliffs to unspoilt hills on the far side of the bay with caves in amongst the cliffs. 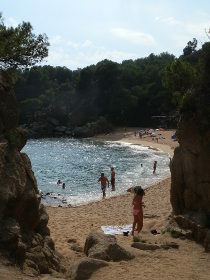 When we were visiting there were long-distance swimmers with safety floats swimming the cliff side of the bay which is part of a bigger swimming club SwimTheCostaBrava.com which also organises long distance swims (4-6km) along the Costa Brava during the summer. The beach itself by the water has good sand and shelves gently into the water making it very suitable for children and the building of sand castles. 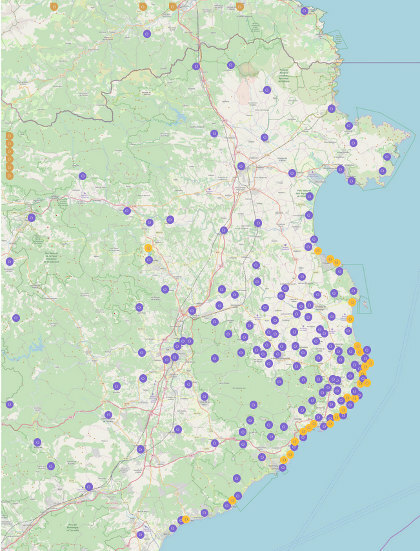 On a July weekend it was popular - parking nearby was relatively full - but not too busy. We saw many French and Dutch people at the beach. For swimming the bay has very clear water to a sandy bottom with good opportunities to swimming a reasonable distance either along the side or across the bay. We saw fish in the sandier areas - shoals of anchovies which is appropriate for L'Escala - and there are more closer to the rocks. The beach is backed by a small summer community with a supermarket, wine store and a variety of souvenir shops. Directly behind the beach are many discrete bars and restaurants looking over the bay without feeling built up or over developed. And directly behind these is a large campground and then the estate of villas on the hill so it feels developed without being spoilt. On the beach is a Chiringuito and it is possible to hire pedalos (which a long slide), canoes and stand-up paddle-boards. The sand is fine particularly close to the water where we saw lots of sand castles. At the back the sand has rounded pebbles in it - not enough to be stony, but enough to make it unsuitable for football or beach volleyball. The bay has a gentle slope so would be good for children. We found the water to be a little chillier than we were expecting in July, but the area to the right side of the bay seemed warmer, but this may just have been the day we were visiting. For snorkling, most of the main bay is sandy so not so good for fish. The rocks to the left and right would be better, but we didn't explore too much. There is parking behind the beach and along the roads, particularly by the campsites. We struggled to find parking spaces close to the beach on a July Weekend, but had no problem with a 5 minute walk from the roads further back. It's possible to walk into L'Escala along the coast and by the port or to walk across the clifftops into the Montgri Massif. Mont-ras, as we've said before, is our neighbourhood and this year, for the second year, it held a Festa de Corpus Christi in the old-part of the village. 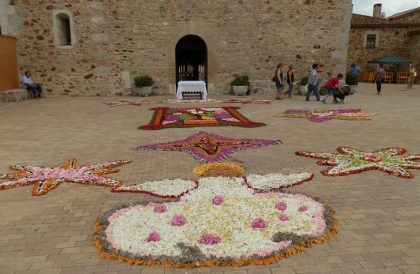 The highlight of the festival was the construction of Catifes de Flors (flower carpets) along the route up to the church and in front of the church. 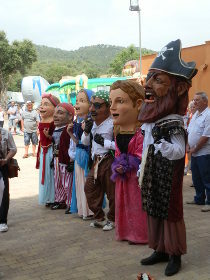 The flower carpets have been a village tradition for many years, but only recently has it been combined into a general village event with craft stalls, capgrosses (part of the Spanish and Catalan tradition of people dressing up as giants or with big heads - literally capgrosses). 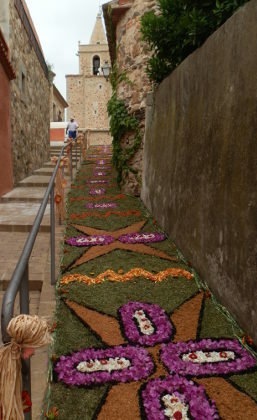 Catifes de Flors can also be found in other Catalan villages and are made from flowers, petals and leaves laid out on the ground to form a picture or design. The petals dry quickly in the sun, so they are constructed in the morning both for decoration but also as part of the procession of Corpus Christi. Corpus Christi itself is a Catholic feast day, so the church plays an important part of the ceremonies, but there is a lot of other things to see too. As someone not too familiar with Catholic traditions, this celebrates the Eucharist - the belief that the bread and wine of communion are considered to be transformed in the body and blood of Christ. On Corpus Christi, the transformed bread is placed in a monstrance and shown around the village by the priest dressed in finery and his entourage. As the procession returns to the church it walks over the flower carpets, before prayers in front of the church and the blessing of the Capgrosses. Mont-ras has turned this into a more general village festival. 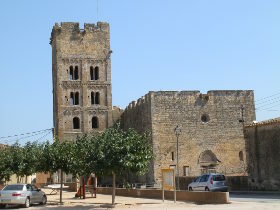 The streets below the church are laid out with craft stalls selling everything from baskets made by the local basket-weaving club, to pastries and jams from restaurants and crafts like woodwork or needlework. In the car park at the entrance is pony riding, and the village hip-hop dancers and Colla de Mont-ras festival float is around. 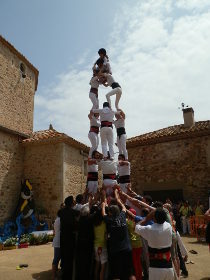 The highlight for us was seeing Castellers building the very typical catalan human towers in the square to the side of the church.